Estonia has one of the most advanced mobile communication markets in Europe, which has received significant investments from such large operators as Telia, Elisa, Tele2. At the same time, the country calling rates are the lowest among European countries. This opens up excellent business opportunities in voice termination, but for effective business it is important to connect a stable Internet. Let’s discuss the situation on the market of Internet services in Estonia. At the moment, the broadband Internet penetration in this Baltic country has reached 92% (more than 1.2 million connections). This is one of the highest rates in Europe. The Estonian telecommunications market is developing well thanks to a number of incentive measures. For example, earlier Telia was the monopolist in the fixed-line market, but later alternative operators began to run their business, which reduced the company's share in the market due to competition. The fixed-line infrastructure was also upgraded to support package offers. Due to this, Telia decided to cease the provision of Internet services based on the DSL platform by 2020. As an alternative, the VDSL infrastructure, fiber-optic networks and the G.fast platform will be used. 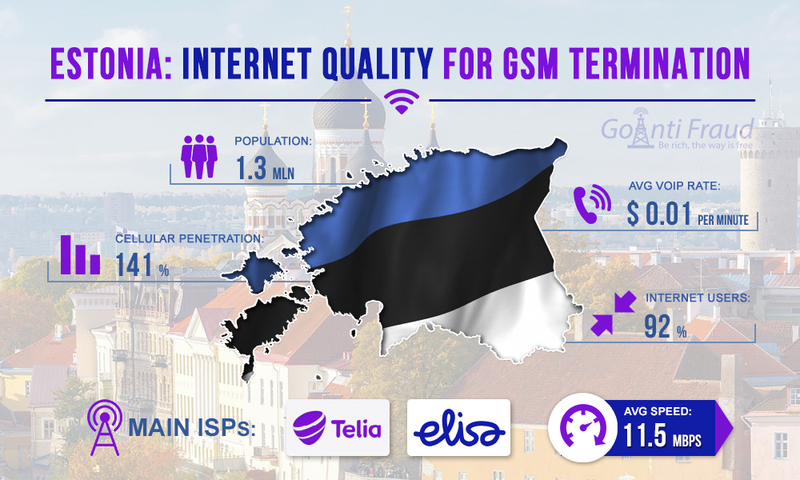 Today, Telia is the dominant operator in the DSL sector and in Estonia you can also connect to the Internet using the ADSL2 +, FttP, Wi-Fi, WiMax, Cable technologies. The main competitors in the market are DSL-based service providers and cable Internet providers. In April 2017, Cableco Starman (the main cable provider) merged with Elisa, and now provides Internet services under the Elisa brand. Now Telia and Elisa are effectively competing with each other, which has reduced the prices for broadband Internet. An average Internet Bandwidth in Estonia is 11.5 Mbps. This is an excellent indicator, and this speed is sufficient even for the equipment to operate on a large number of channels (for each channel of a mobile phone voip gateway, it is necessary to ensure an Internet speed of 42 Kbps).